Demostrators developed with the Novel Metal-Ceramic Functionally Graded Materials (FGMs). materials through spatial variations of material composition and microstructure. Specifically, MATRANS deals with two groups of bulk FGMs: (i) ceramics-copper/copper alloys, (ii) ceramics-intermetallics. These FGM systems have not yet been used in the transport sectors targeted. The MATRANS methodology is problem-oriented and comprehensive combining interrelated activities of material processing (core activity of the project), characterisation, modelling and demonstration. The processing will encompass starting materials (e.g. nanopowders) and the resulting FGMs. Characterisation of the FGMs will include detailed description of microstructure, measurements of physical and mechanical properties and residual stresses. The modelling will be carried out at a design phase and for the material response to combined thermomechanical loading and extreme service conditions. Extensive use of multiscale approaches and numerical methods will be made. The project addresses the joint design of the FGM and the structural component it is intended for. Economical and ecological aspects of processing are included. Risks aspects of material non-performance will be tackled, too. MATRANS has mobilized a critical mass of interdisciplinary expertise and highly specialized equipment. The consortium includes leading groups from materials science, physics, chemistry, mechanical engineering and computer science. The industry and SME involvement in the project is substantial. As the exploitation measures, the industrial partners will define business plans and start pilot cases during the project, followed by upscaling activities after the project end. R-Tech Specific Role: R-Tech is developing the modelling of uncertainties in FGM production (what can cause the aberration from the target characteristics) and characterization (how much the measured properties meet the target ones and what is the uncertainty in the results of characterization). 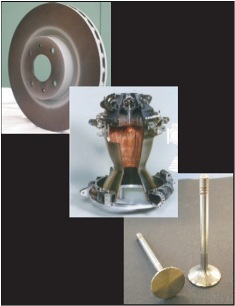 R-Tech also deals with the Life Cycle Assessment (LCA) as a methodology for assessing the environmental aspects associated with brake disk demonstrator.